OUR 2018 CHRISTMAS SALE HAS ENDED, BUT DON’T BE DISAPPOINTED. SIGN UP TO OUR NEWSLETTER BELOW, TO BE THE FIRST TO KNOW WHEN WE HAVE OTHER SALES OR SPECIAL PROMOTIONS THROUGHOUT 2019. Mallorys Tocino is pleased to bring you our best ever, Christmas Bonus Sale! Buy 10+ packs of 100g Jerky to receive FREE Postage – PLUS – receive 2x Extra 100g packs for FREE! You must purchase at least 10 packs of 100g jerky to receive this special offer. You will pay no postage on the 10+ packs of jerky, and the free bonus packs. The only time you will pay postage, is if you also add other items to your purchase, like our 300g, 500g or 1kg packs. If you only buy 10+ 100g packs, you will pay no postage. The 2x bonus 100g packs are free. Lory or Malcom will chose the flavour and type of jerky you receive. There is no set type (ie beef jerky, chicken jerky) or no set flavour (ie butter chicken, sweet chilli etc). Your two free packs of jerky will be chosen at random, and added to your order. The two bonus 100g jerky packs will be added to your order when we pack them. Do not add the extra jerky to your cart, otherwise you will be charged for them. Perfect Christmas Gift or Celebration Snack! Purchase this awesome deal as a Christmas gift for someone special. We can even send it direct to your family or friends! Simply place your order and enter the shipping address of who you wish it to be sent to. Pop us an email to let us know it is being sent as a gift. The cut-off is the 18th December 2018 for delivery in time for Christmas. 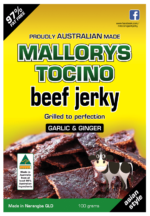 Have a happy and safe holiday from Mallorys Tocino! Posted in Asian Jerky, Asian style jerky, Beef Jerky, Chicken Jerky, Jerky Australia, Jerky Events, Pork Jerky and tagged Christmas gift, Christmas sale, free postage.